This photo was taken in London last Wednesday. 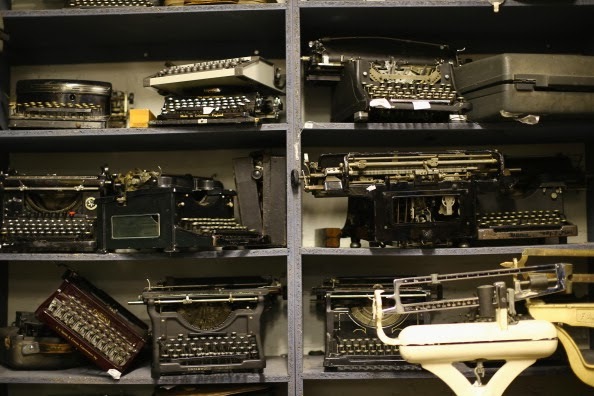 It is of typewriters sitting on shelves in the British National Theatre's Costume and Props Hire Department in Kennington. The department is the home of more than 85,000 items, including suits of armour, medieval masks, corsetry and period dresses, all of which have been produced or brought to be part of National Theatre productions during the last 50 years. The collection now services the public along with TV and film companies. Gosh, thats a few machines in sorry condition. A few theatre companies in Australia have a selection too, but they tend to be only a handful of machines. What's the funny rounded top one, top left of picture? Steve: maybe Empire no. 2? I wish they treated these things with a bit more care.